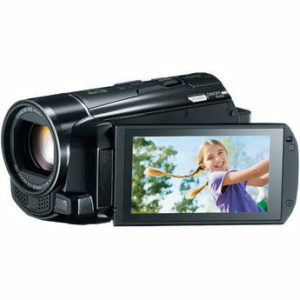 The Canon Vixia HF M500 is truly an awesome video camcorder with an amazing amount of features for the style and price. If you’re looking for a low budget, economical camcorder that records on memory cards and not only gets a sharp, clear image, but allows you to choose between two popular recording formats (mpg4 and AVCHD) then put this Canon on your list. Canon was really smart and also included a microphone input and headphone jack, so the HF M500 also allows for quality sound recording too. IMHO as a lover of video cameras, the Vixia HF M500 is amazing, especially when you consider the bargain price at less than $350. The HF M500 is a Full HD Camcorder, producing is a 1920 x 1080 high def image. It records using an SD/SDHC/SDXC memory card slot that supports up to 64GB memory cards. That is a lot of storage for a tiny camera and equals several hours of footage. With this camera, you get a fairly large (1/3″) HD CMOS Pro Sensor and image processor that work together to provide images with resolution high enough to look great, even played on your large screen HDTV. Online where screen size is smaller, your video is going to look awesome and this camera gives you a very important and advanced feature for just that difference. With today’s many varied destinations for video, it is a fantastic feature for a camera in this price range to be able to allow the user a choice of which format to record in. The HF M500 allows you to do that. If your video is going to be online, choose MPEG4. If your video is for home movie use on your own HDTV, or for archiving to blu-ray, choose AVCHD. The difference boils down to file size, which in turn, boils down to whether your videos work well online without converting them to a web-ready format. On the flip side, the AVCHD looks much better on your HDTV. Allowing you to record in either AVCHD or MP4 format is an advanced feature for such an inexpensive camcorder. AVCHD’s higher bit-rate and finer resolution will yield the highest quality video for viewing on an HDTV or archiving to Blu-ray. File sizes that huge and heavy would NOT be good for online use however. For digital use, the camcorder lets you record in MP4 format, which produces files you can share right away with no need for conversion. Any video you shoot is immediately available to upload to social networking sites like Facebook or YouTube if you record in the MPEG4 format. One advantage for this size video camera over a pocket cam is that you get a decent lens with some zoom capacity plus a slew of features that truly do equal better, more versatile shots. The HF M500 features a Canon 10x HD optical zoom video lens, optical image stabilization, powered image stabilization and a 3.0″ widescreen touch screen LCD display. I’ve already mentioned how important it is to have a microphone input. This camera has a mic input and a headphone jack both. These connectors make it possible to capture high quality audio. In addition to using an external mic for audio, the HF M500 features an enhanced internal microphone, which gives you the choice of 4 different recording directions, including monaural, stereo, wide, or synced with zoom. This feature also allows for adjustment between low, mid-range, and high frequencies. Extremely impressive feature in and of itself that a serious videographer could really take advantage of. All in all, the HF M500 packs an amazing amount of features for a 11 ounce video camera costing less than $350! Article and camera reviews on Video Production Tips are written by Lorraine Grula, a lifelong camera lover who worked in the television and video business as a videographer, field producer and video editor. She now produces online video commercials for clients and serves as online video consultant. Maximum Recording Time (Recording times are based on one 64 GB SDXC Memory Card, not supplied). Max Shutter Speed Movie: 1/2000 sec. All figures given are for the distance from the lens front. Accessory Shoe Mini Advanced Accessory shoe available. However, only the video light function is provided by the VFL-2 video light flash. * Use of Class 4 or above (4, 6 or 10) memory cards is recommended for recording MXP or FXP (1920 x 1080 pixel recording) movies. For other recording formats, a Class 2 or higher card is recommended. Also, movie (AVCHD/MP4) recording requires cards with 128MB of memory or more. Thanks for a great post! This sounds like just the type of camera I need but being 3 years on it’s not on the market now – do you have any details of what the current equivalent might be? Glad you liked the post. Canon has a whole line of cameras under the name Vixia. So even though this particular model is not longer available, the line is still viable. Try the Canon Vixia HF R62. It is priced even lower at $250 and still has the mic input. I think that is a really important feature like I said in the article. If that model, is not to your liking, you could look at others in the line and see what appeals to you. B&H PHoto is a great place to research and buy. They have so much nf in each camera and the prices are generally about as low as they come. I hope this helps! Thanks for stopping by my website.